Cyclists are some of the most dedicated sports enthusiasts out there, and they’re always on the lookout for gear and gadgets to improve their performance. Whether you’re a cyclist yourself, or just know someone who is, check out this list of the latest and greatest in cycling gear and gadgetry, and indulge yourself or the cyclist in your life with something she or he will sure to love. Cars and trucks have blinkers to let drivers behind them know when they’re going to make a turn, while cyclists traditionally use hand signals to alert vehicles behind them of their intentions. The problem with hand signals is that not everybody is familiar with them and the intent might not register quick enough or at all. Instead, attach an under-seat mounted battery operated turn signal with ultra-bright LED lights to signal a turn. 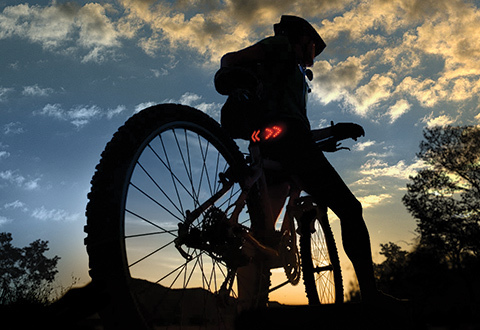 It’s operated by a simple three-button controller attached to the bike’s handlebars, and even includes hazard lights (center button) in case your cyclist is sidelined by a flat or other mishap. If your cyclist’s favorite bike isn’t equipped with a couple of good rearview mirrors, it isn’t as safe as it could be. Corky’s Rearview Cycling Mirror attaches easily to drop bars, has a pop-off cap to keep it protected while your bike is in storage, and offers 360 degrees of rotation to view everything around you for an incredible 40 meter distance. Its aerodynamic design won’t slow you down, either! And how about a crash sensor that clips to your helmet and sends your GPS coordinates to your friends and loved ones via its accompanying app? Cyclists cover a lot of miles and tend to favor winding country roads or heavily wooded mountain trails where there may not be anybody around to discover them for hours or even days. Here’s how it works: A countdown is triggered during an accident. If it’s not disabled, your coordinates go out via text to those you’ve listed as your emergency contacts. Available for iPhone 4S and above and for Android version is available for Nexus 4 and 5 phones, for other Android devices running 4.3 or later. Most gloves work well for grip between the glove and the handlebar, but GripGrab Racing Gloves have silicone dots on the inside (InsideGrip) as well as the outside of the palm, to prevent the hand from slipping inside the glove. These award-winning gloves are made for mountain bike racing, but work equally well on the road. Serious cyclists are always challenging themselves to take it to the next level, and Lazersport’s Lazer Z1 Lifebeam Helmet has an integrated heart rate monitor to keep tabs on your cyclist’s performance. Its Bluetooth/ANT + sensor is embedded in the helmet’s forehead padding and powered by a small, detachable battery pack on the back of the helmet. This super cool-looking top-of-the-line helmet provides an accurate heart rate reading without the need to wrap a strap around the chest. Long distance rides call for a prepared cyclist and Silca has the solution. Its Seat Roll Premio carries all the essential tools neatly under the saddle. Taking the ever-practical and stylish tool roll to the next level, Silca’s durable waxed canvas pack with reflective stitching features three pockets to hold tubes, CO2, tire levers, a multi-tool, cash, and whatever else you can manage to fit. A flap folds down over the pockets and once it’s rolled up, a BOA closure securely fastens the roll to the underside of the seat. Your favorite cyclist will remember you every time they hit the road (or the trail) if you gift them with any of these high-tech cycling items, and best of all, you’ll be giving them something that shows you respect and admire their passion for the sport!